* There are 20,000 centuries in 2,000,000 years. * There are about 5,475.8 years in 2,000,000 days. * There are 83,333 1/3 days in 2,000,000 hours. * There are 33,333 1/3 hours in 2,000,000 minutes. * There are 1,136 4/11 miles in 2,000,000 yards. * There are 666,666 2/3 yards in 2,000,000 feet. * There are 166,666 2/3 feet in 2,000,000 inches. Naturally, that depends on how fast you can count. But if you can count from 1 to 100 in one minute, and you keep counting every minute, without stopping, for eight hours every day (taking time off to eat, sleep, and go to school), you would reach 1,000,000 in 20 days, 6 hours, and 40 minutes, or almost 3 weeks. If, however, you give up eating, sleeping, and school, and just count every minute of every hour of every day, you would reach 1,000,000 in 6 days, 22 hours, and 40 minutes, almost 1 week. Being an English teacher and not a mathematician, I would guess it would take more than twice that to arrive at two million, as one would surely slow down during the process of all that counting–not that one would even dare undertake such a tedious task. But I’m celebrating the Governor’s success, so you’ll simply have to excuse me. On a more serious note now, let’s examine the number of Facebook friends of those whose names get mentioned alongside Governor Palin’s in the ongoing 2012 conversation. Mitt “Flip-Flop” Romney, whom Bill O’Reilly just divulged to Jay Leno is his 2012 favorite, has a whopping 468,436 Facebook friends. Newt Gingrich, who has recently stated he is seriously considering running in 2012, has a total of 70,311 Facebook friends. And wouldn’t I be remiss if I left out Ron Paul who boasts hordes of very vocal young and, I would imagine, internet-savvy supporters? This “Ron Paul Revolution,” as they have been called, has fortified him with a 239,427 Facebook total. Let me state the obvious. 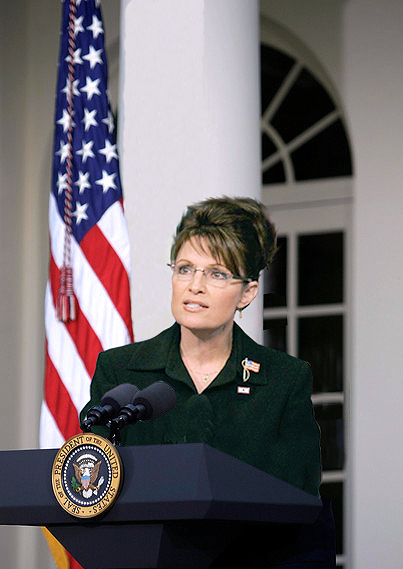 Governor Palin’s common sense conservatism has grabbed both the hearts and intellect of women and men who want to see order restored to our government. Two million is a huge number, but it in no way is the sum total of those who support the work she is doing. Many of her supporters don’t do Facebook, just as many don’t do Twitter. But most every one of us can do the Governor and America a huge service: we can donate to SarahPAC so that her influence can not only continue but accelerate. Is there any other voice out there sounding the alarm for you, your family, your businesses, and your freedoms as is Governor Palin’s? She is traveling the country garnering support for others who are following her lead in taking back our country. She doesn’t cower in fear before putting her name to a candidate’s face or to a controversial issue, even when it earns her the acidic vitriol of the Left–and some on the Right. It takes finances to do the job she’s doing. We’ve already established how big a number two million is, so two million people giving whatever they can will go far distances and reap even far greater rewards. 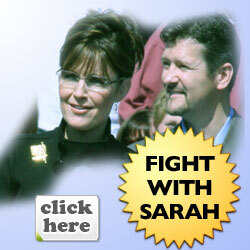 You can read more posts about the SarahPAC money bomb here and here. 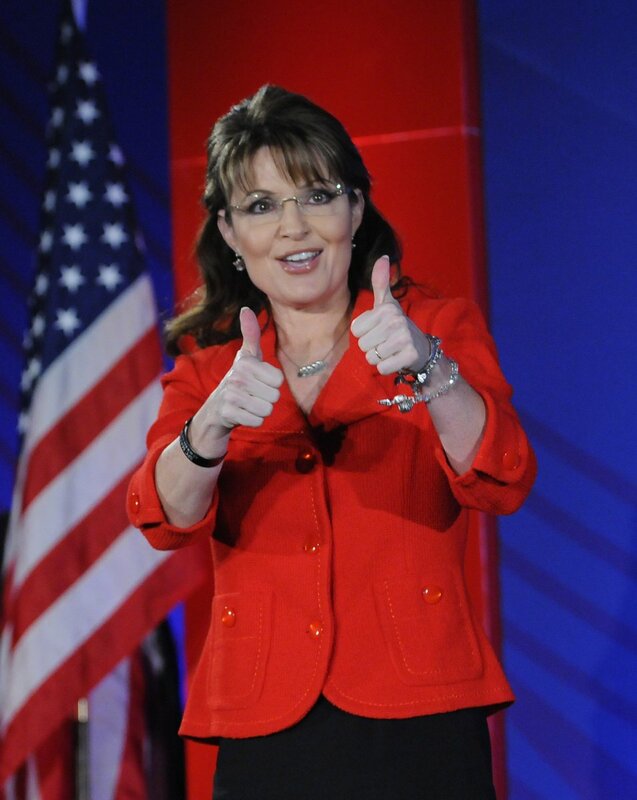 Congratulations, Governor Palin, on The Big Two–and thank you to all who helped get her here. Now, let’s BLAST the Money Bomb! * Facebook stats appears as they were at the time of this writing. “One carries a purse, the other carries baggage,” the 30-second ad begins. The TV spot follows on the heels of an AJC report of federal grand jury interest in a meeting called by Deal in the hope of preserving his business with the state. 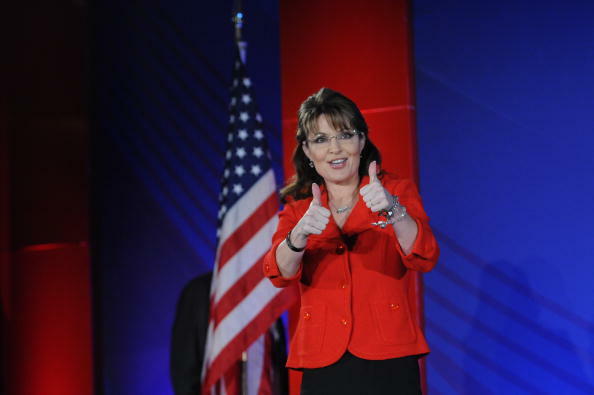 It’s also the first major use that Handel’s been able to make of the Palin endorsement – which arrived late in the primary, after the former secretary of state’s slim finances had already been committed. Male voiceover: One carries a purse. The other carries baggage. 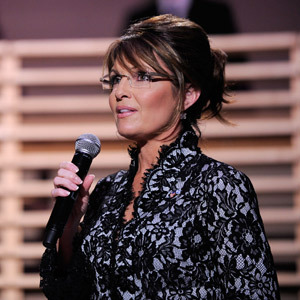 One whom Sarah Palin says has cut government, and is the true conservative. Or the other, who added trillions to our national debt. One a conservative reformer. One a corrupt relic of Washington D.C.
Karen Handel is Georgia’s strong conservative. Impeccable integrity. Our thrilling, vibrant future. Karen Handel. Bring it on. The ad by Fred Davis incorporates the black, white and red tones of Handel’s single “Lipstick” ad in the GOP primary. 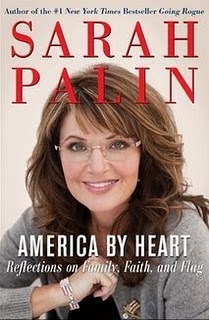 The cover photo for Sarah Palin’s new book is a portrait in red, white, blue and gray. The Alaska ex-governor and former Republican vice presidential candidate is photographed in close-up, wearing a gray sweater and American flag pin, which matches her flag bracelet. Her book, “America by Heart: Reflections on Family, Faith and Flag,” comes out in November. HarperCollins, which also published Palin’s million-selling “Going Rogue,” revealed the cover design Thursday. “Sarah” and Laura had completed their usual pre-flight duties. They got their weather briefing, filed the flight plan and had to wait. This flight would take them to Peoria, IL. 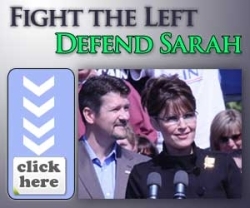 There, a motorcade would pick up “Sarah” and take her to Eureka College to give what would be her version of The Speech, which they watched on “Sarah’s” laptop computer. Having watched the video, it was time to leave. The pair hopped in the plane, Laura did the run-up and got her clearance. A LearJet was sequenced ahead of her. “‘Sarah,’ the next trans-continental trip we do, I’ll take you in that,” Laura said. 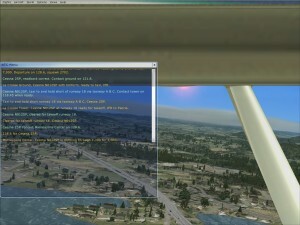 Laura had filed for and received a clearance to cruise at 7,000 feet. The mighty Mississippi River came into view off the right wing. Near Dubuque, IA, “Sarah” and Laura spotted a large isolated cumulus cloud. The rain shaft was clearly visible. Flying through clouds was no mean feat of course for Laura, who is a skilled instrument pilot. Then she saw a flash of light from within the cloud, followed by another. The forked lightning strikes clearly indicated a thunderstorm – which did not come up on the weather briefing – but it came up here. Laura immediately requested a descent to 5,000 feet to stay below the thunder cloud, and permission to deviate toward the southwest, then back so as to go around it. As Laura went around the cloud, she started planning a possible diversion. If this storm grew or followed the flight, Laura would divert to the nearest airport and land. Yes, “Sarah’s” family was waiting for her in Eureka. Her hair dresser from Wasilla – Jessica Steele – was waiting too, only “Sarah” did not know that. The arrangement was a gift, and Laura had her little hands in that one. But, Laura was a disciplined pilot, and “Sarah” a disciplined passenger. 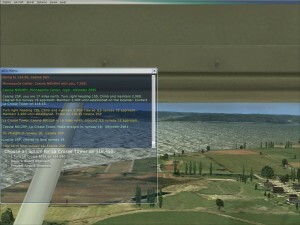 Getting there alive, and with a plane that could be used again was something of a priority. 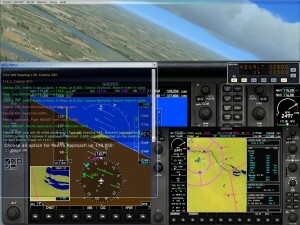 While poor visibility kills pilots without an instrument rating, thunderstorms and icing are the killers for those with the rating. Laura knew that. She carefully watched the storm and saw it was stationary. Soon, the potentially life-threatening monster was left behind. The pair decided to continue the flight. The flight passed Quad Cities. Here the Mississippi River runs east to west rather than north to south. It is the only location in the United States, where the Mississippi River takes this turn. Laura received her clearance for the approach to Peoria. 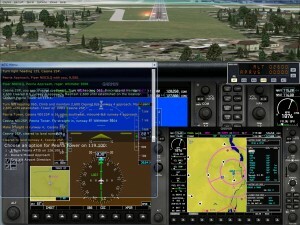 The instruction was to fly to the southwest of the airport and land on the runway oriented northeast. Laura setup the approach on the GPS. The plane was buffeted about as the approach began, just like in La Crosse. The pair thought nothing of it. The approach was perfect. 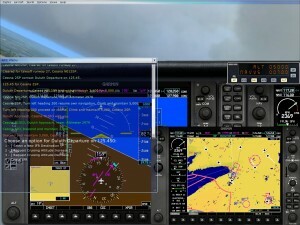 Laura has passed decision height and was ready to land, when a violent wind shear struck. There was no time to check on her passenger. Laura immediately applied full power, raised the flaps one notch at a time and told the controller she was going around. 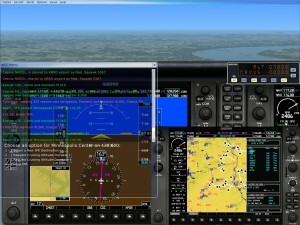 Laura got setup to re-do the approach. “Sarah” and Laura both saw that some clouds which were over the airport were now south. The second approach got them in. Laura taxied to General Aviation and tied down. The motorcade pulled in to get “Sarah” and her pilot. “Sarah” had a summons to answer. 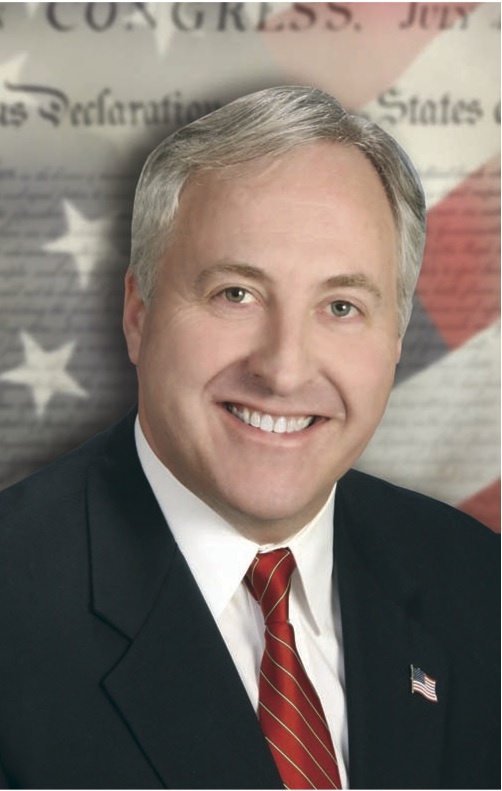 Eureka College could be the place where Gov. 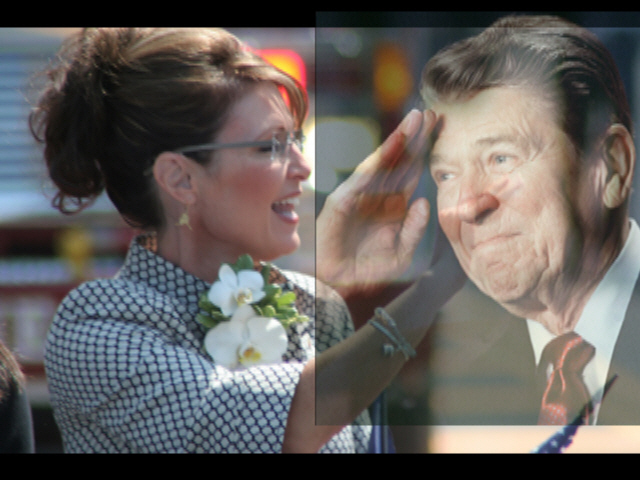 Palin’s summons to carry the Reagan legacy would be answered. Take a look at this great article on Obama’s commission to investigate the Gulf spill. The commission’s focus on drilling safety will be cursory — only to check the box that it took an alleged hard look at the issue. The obvious goal of the environmental activists on the commission will be to draw preconceived conclusions in order to justify regulating/taxing the oil & gas industry out of existence. The commission appointed by President Obama to investigate the Gulf oil spill (the National Commission on the BP Deepwater Horizon Oil Spill and Offshore Drilling) does not include a single member with specialized knowledge of petroleum engineering. This is akin to performing a heart transplant with a surgical team that has never set foot in an operating room. If the president’s intention was to prevent future leaks, why would he appoint a commission with no knowledge of drilling? The answer, it would seem, is that this commission was never meant to perform the task it was officially charged with. It was never really intended to be a commission on drilling safety, but rather a group of environmental activists intent on regulating and taxing the oil and gas companies out of business. Its report is unlikely to focus on improved safely measures with the intent of increasing oil and gas exploration and production. It will more likely issue a blueprint on how to restrict drilling while extorting profits from oil companies by way of new fees and regulation. There are two crucial lessons to be learned from the Deepwater Horizon accident, but it is doubtful whether the commission will comprehend either of them. The first is that “best practices” exist which, had they been strictly adhered to, may have prevented the Deepwater Horizon accident. It is for the commission to determine whether they were followed in that case, but it is incontrovertible that best practices have prevented significant accidents on all of the other 40,000 wells drilled in the Gulf. These practices, with continual improvement, should prevent spills in the future as well. For most Americans, new drilling and the energy independence that comes with it seem like a good thing, but that is the very reason why the president has appointed a commission hostile to increased drilling. The success of the free market in the United States depends to a great extent on the availability of cheap energy. By cutting off the supply of oil, natural gas, and coal, Obama ensures a continuation of high unemployment and an extended period of slow growth, and with these, the expansion of the socialist welfare state. Nothing could be further from the interests of the modern-day Democratic Party than the transformation of the American economy into a flourishing free-market economy powered by cheap and reliable fossil fuels. The fight over drilling, in this sense, is nothing less than a struggle for the future of capitalism in America. I’m happy to endorse two more Commonsense Conservatives running for Congress from the great state of New York. John Gomez, a native Long Islander, is running in New York’s 2nd Congressional District. As a successful business owner, John understands how to incentivize job creation to get our economy moving again. He’s dedicated to reining in the reckless spending in DC and returning us to our core principles of limited government and fiscal responsibility. Please join me in supporting John by visiting his website at www.gomez2010.com and following him on Facebook and Twitter. 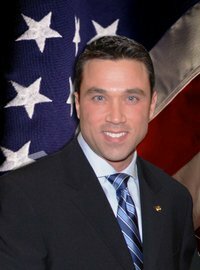 Michael Grimm, a former Deputy U.S. Marshall and FBI Special Agent, is running in New York’s 13th Congressional District. This decorated Marine and Persian Gulf War veteran took on organized crime and Wall Street corruption as an undercover agent. As a current small business owner, Michael understands that real economic growth comes from the private sector, not government. He’ll represent New Yorkers with just as much integrity and courage as he defended them in the FBI and the Marine Corps. Please join me in supporting Michael by visiting his website at www.grimmforcongress.com and following him on Facebook and Twitter. It did not take too long for “Sarah” to consider it. The next flight would bring her to Peoria, where would speak at Eureka College – President Ronald Wilson Reagan’s alma mater. Canceling would mean an extended 400-mile flight from Duluth to Peoria, rather than two more pleasant flights of 200 miles each. Laura filed, pre-flighted, did the run-up, got the clearance, shut down, and went to get “Sarah”. Laura gave her passenger the required safety briefing, ensured safety belts on, and fired up. They would depart to the west, then turn to the southeast for the 90-minute flight. After takeoff, per the clearance, the flight turned southeast. The cloud cover was broken, but closing fast. “Sarah” turned to bid Lake Superior a farewell. 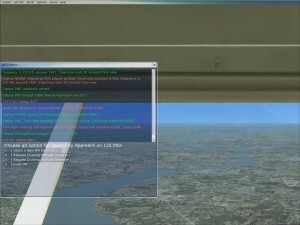 The flight had been cleared for 5,000 feet originally, but cloud tops were predicted to be 7,000. Laura requested an altitude increase to 7,000, but the tops grew even higher and the broken clouds went complete overcast. The entire enroute portion was spent shrouded in clouds, just as Laura predicted. The controller instructed Laura to descend to 2,900 feet. She would be landing on the runway facing due south using an instrument approach. At about 3,500 feet the flight broke out of clouds, and the airport could be seen in the distance. La Crosse Municipal is located on French Island, which is surrounded by Lake Onalaska. Both Laura and “Sarah” felt something very familiar when they saw the lake. It had an Alaskan feel to it – perhaps accounting for why it is called Lake Onalaska. Part of the lake is in Minnesota. I-90 bisects French Island. The Mississippi River passes through La Crosse as well. As Laura began the approach, the plane received two jolts of turbulence. 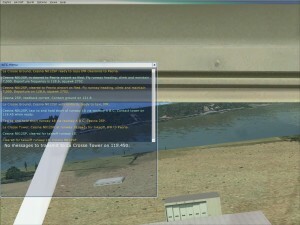 “Sarah” could see Lake Onalaska out the front and out her side window. At 300 feet above decision height, the plane began to cross Lake Onalaska. 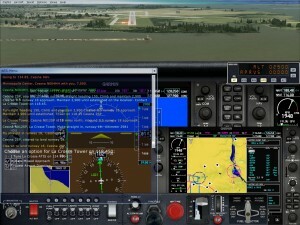 Laura executed a smooth landing and parked at the General Aviation ramp. “Sarah” is now 2,512 nautical miles from Wasilla. She is now over 75% of the way to Reagan National Airport in Washington DC. “Sarah’s” next flight is to Peoria, one of the most significant stops on the journey. Alaska. Lake Onalaska. Eureka College – Reagan’s Alma Mater. Reagan National. Providential.